Laborde Products markets throughout North America. 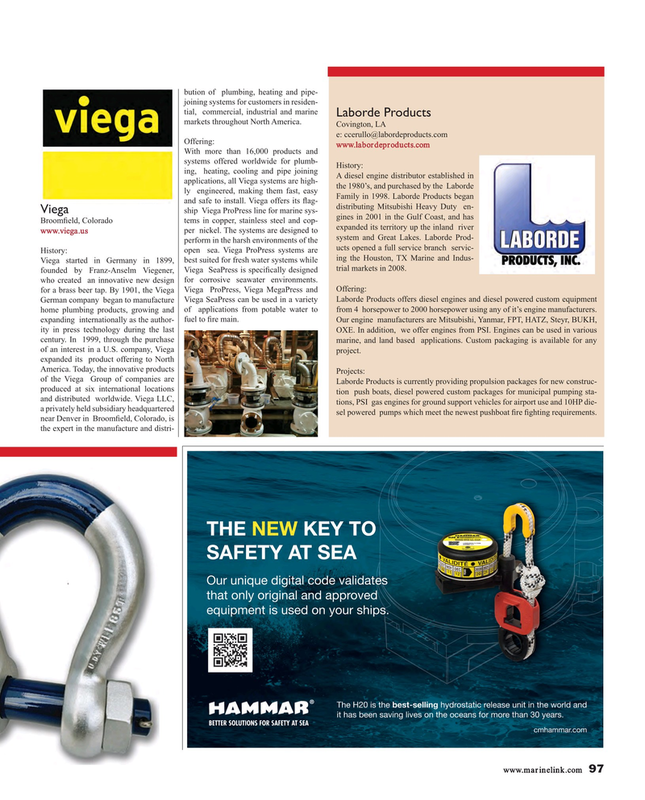 Viega started in Germany in 1899, best suited for fresh water systems while trial markets in 2008. German company began to manufacture Viega SeaPress can be used in a variety Laborde Products offers diesel engines and diesel powered custom equipment home plumbing products, growing and of applications from potable water to from 4 horsepower to 2000 horsepower using any of it’s engine manufacturers. expanding internationally as the author- fuel to ? re main. Our engine manufacturers are Mitsubishi, Yanmar, FPT, HATZ, Steyr, BUKH, ity in press technology during the last OXE. In addition, we offer engines from PSI. Engines can be used in various century. In 1999, through the purchase marine, and land based applications. Custom packaging is available for any of an interest in a U.S. company, Viega project.